“Uh, a lot,” I said. I mean, I teach lefse classes and I’ve written two books on lefse: The Last Word on Lefse in 1992 and Keep On Rolling! Life on the Lefse Trail and Learning to Get a Round, which was released this week. But Margaret Ann knew that. I had gotten to know her as I researched Keep On Rolling! so she was well aware of my books. Something was up. “Well, how would you like to be a judge for the National Lefse Cook-off?” Margaret Ann is chair of the cook-off, which will be a big draw at Friday’s Potato Days in Barnesville, Minnesota. I will be there both Friday and Saturday selling my four books on lefse and lutefisk, illustrations from Keep On Rolling!, heirloom lefse rolling pins, and copies of the musical score “Keep On Rollin’”. I said I would be glad to serve as one of the three judges. But now, a few days after Margaret Ann’s call, I have second thoughts. This may be an assignment fraught with peril. First, I’ll be judging lefse? I have trained myself to judge not, especially not anyone’s lefse. I have always thought it best to applaud all efforts to make lefse no matter how well it turned out. So, can I make the gut-wrenching calls required of judges in a National Lefse Cook-off? Second, I won’t be able to observe the cook-off. Judges are sequestered so that we will only be judging the lefse’s taste and appearance, not who made the rounds. So, I’ll bring a book. I am enjoying Minnesota Senator Al Franken’s Giant of the Senate. Third, I’ll have to vote and skedaddle. Margaret Ann says it is not unheard of that non-winners squawk and hunt down judges, demanding answers. 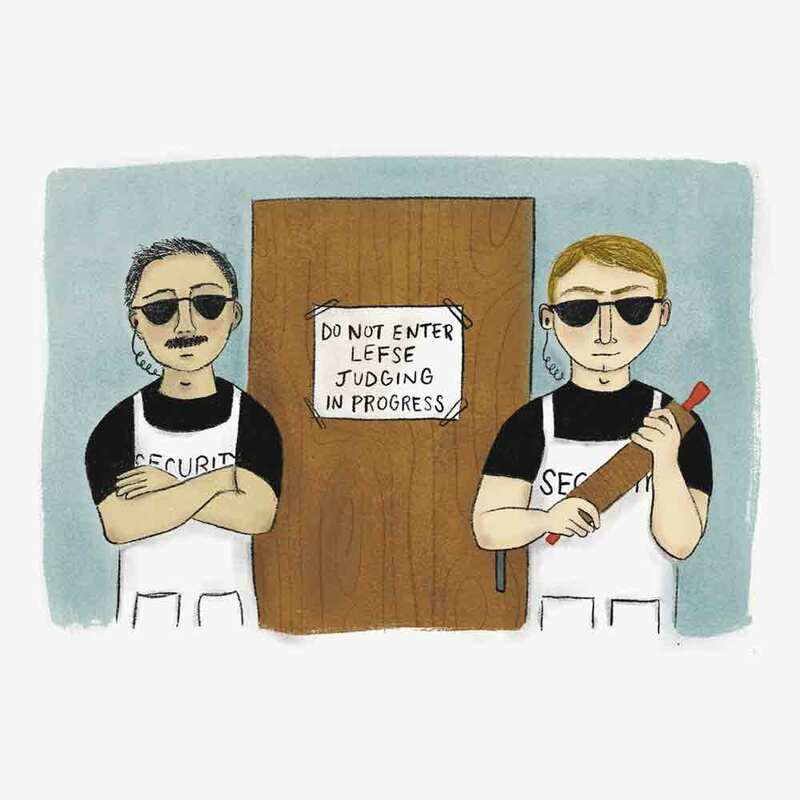 Therefore, she says judges make a habit of hightailing it out of Hildebrand Hall, where the cook-off occurs. Good thing I run for exercise. Oh, what we don’t do for love, the love of lefse! Pray for me, that I have sound judgment and fleet feet. How Will Keep On Rolling! Play in Barnesville? I am super pumped as I prepare for the street fair at the Potato Days in Barnesville, Minnesota, which is Friday and Saturday, August 25th and 26th. As I have researched and written Keep On Rolling! Life on the Lefse Trail and Learning to Get a Round for the last year, I have had this festival in mind as the perfect place to launch the book. 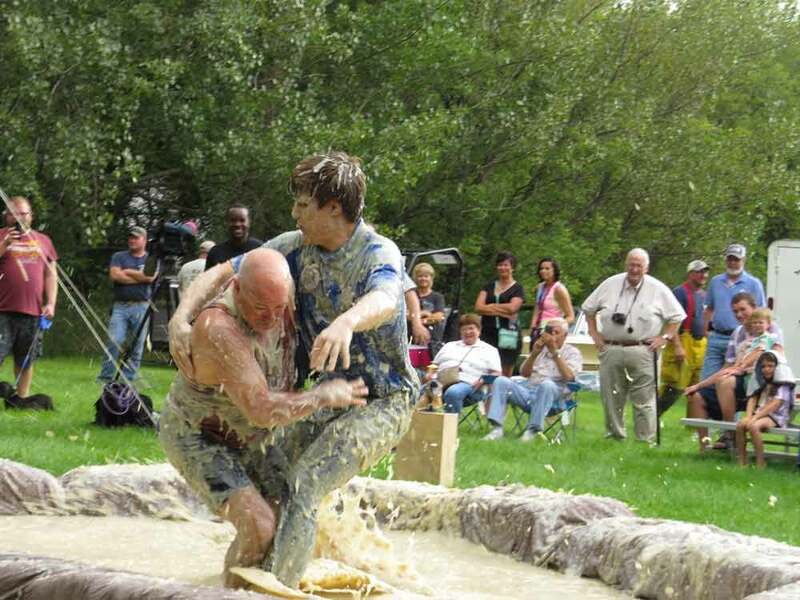 Barnesville, after all, is one of 13 stops on the Lefse Trail—which is central to the book—because the Potato Days has mashed potato wrestling matches and the National Lefse Cook-off. Well, the book launch is on schedule. Keep On Rolling! arrives a day or two before I drive to Barnesville. Yaba daba dooo! I go to my fair share of art fairs, and I’ve always envied the artists and artisans. Not long after producing their art, they get feedback at the fairs and find out what people like through sales and comments. Writers don’t get out much to sell their books in the marketplace. That’s too bad. They don’t observe how potential buyers are drawn to the book in the midst of many other products at the fair. They don’t see how customers pick up a book and leaf through it as they contemplate a purchase. They don’t hear the questions and comments about what customers think the book is about, based on the back cover, table of contents, look and feel of the book, etc. They don’t see the smiles of approval as customers read a passage or study an illustration. So I’m jacked to jump into the marketplace at Potato Days and see how the covers, illustrations, photos, rosemaling, lefse characters, lefse-wrap recipes, lefse remembrances, original lefse quotes, heirloom rolling pins, and a brand new lefse song that are in Keep On Rolling! play to the Barnesville masses. Just What Is the Lefse Trail? Michael Stein interviewed me last week for a story he was writing for the Barnesville Record Review. The story, which ran today, featured my newest book, Keep On Rolling! Life on the Lefse Trail and Learning to Get Around, which I will be selling Friday and Saturday at Barnesville’s Potato Days. There is a whole chapter on the Potato Days in Keep On Rolling! because Potato Days is a great festival and because of its National Lefse Cook-off. The cook-off has put Barnesville on the Lefse Trail. During the interview, Michael asked about the Lefse Trail. Is that something I made up? When I planned the book, one of my goals was to travel to the six largest lefse-making factories and check with the owners to how the lefse market was holding up. I did so and found the factory tours to be fascinating, and the drive to each small town factory to be rewarding and relaxing. My research turned up seven other stops that held the promise of fresh lefse and lefse-related museums or festivals. What could be better in travel? As I would tell family and friends about these journeys, I would often lead off with “My lefse travels take me to …” or “Today, life on the lefse trail leads me to …” And there is was, the beginning of the Lefse Trail. 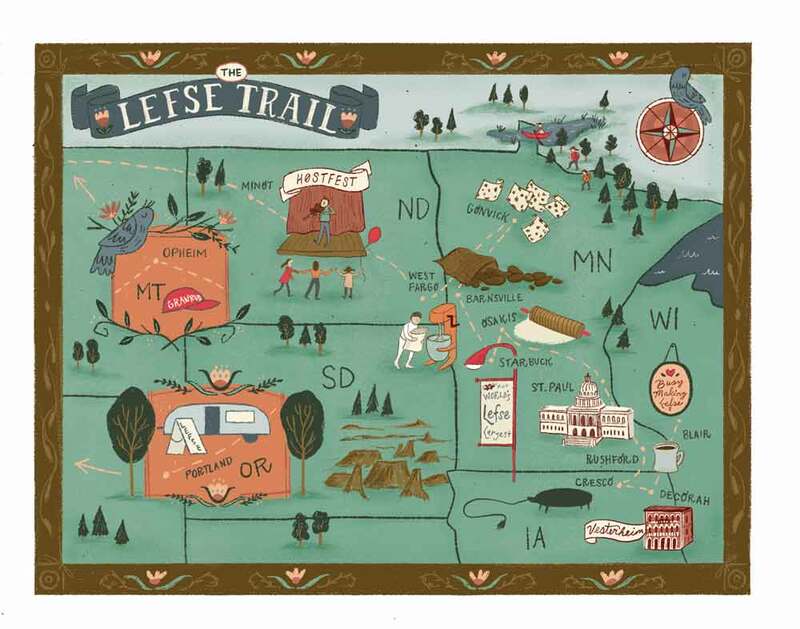 May lefse lead you along the Lefse Trail, which covers Wisconsin, Iowa, Minnesota, North Dakota, Montana, and Oregon.